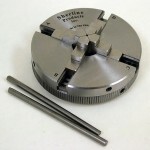 Sherline Chucks - Millhill Supplies Ltd.
Three-jaw and four-jaw chucks offer a quick and convenient way to hold a workpiece while it is turned on the lathe. A chuck can also be clamped to a mill table to hold a part for milling. Drill chucks are used to hold drill bits. Sherline manufactures our own chucks to a high degree of precision on CNC machines. The jaws are ground and fitted to each chuck by skilled technicians to assure maximum accuracy. 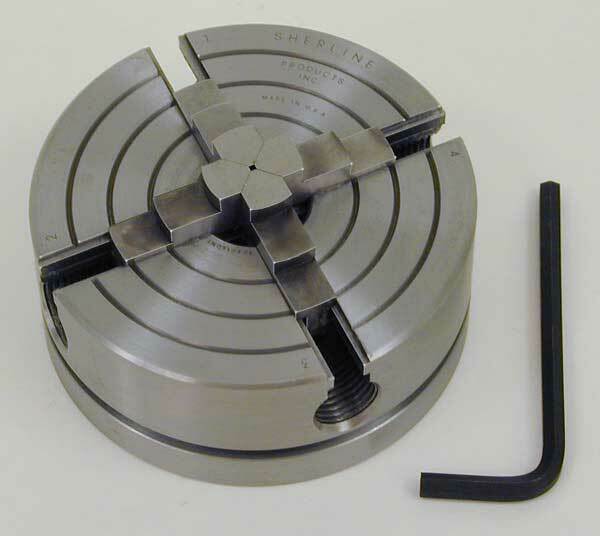 Three-jaw chucks are normally used to quickly hold round or hexagonal stock. The jaws scroll together as the ring of the chuck is turned. Parts can be held quickly with relatively good accuracy. Runout is less than .003″. Four-jaw chucks have jaws that adjust independently. They are used to hold round, square or rectangular work. Since the jaws adjust independently, it is possible to achieve perfect centering of the part with proper adjustment. This process is more time consuming than using a 3-jaw chuck, but it offers the most accuracy. 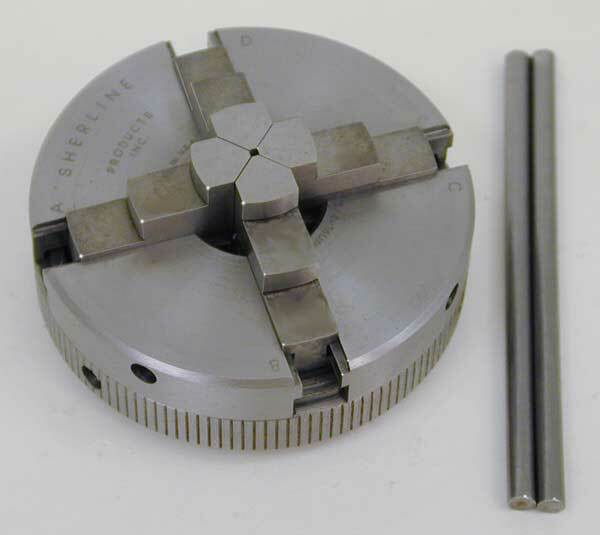 The Sherline chucks above are available in 2.5″ and 3.1″ diameters. The jaws are reversible for a larger clamping range. Soft (unhardened) jaws are available as an option. Our chucks normally come with a 3/4-16 internal thread for use on Sherline spindles, but other threads are also available to fit different small machines. Also available are self-centering 4-jaw chucks. They are adjusted like a 3-jaw chuck and can be used on round or square stock, although the stock must be accurate for all four jaws to grip properly. They can be used to quickly hold square material or to provide an extra jaw to spread out the crushing force when holding thin tubing. This chuck is available in both 2.5″ and 3.1″ diameters. Sherline’s drill chucks are made in the USA by Jacobs. We supply a #0 Morse arbor for use in the tailstock for center drilling. The chucks are also available with a #1 Morse arbor and drawbolt for use in the headstock for drilling on the lathe or mill. They are available in 5/32″, 1/4″ and 3/8″ sizes. Runout is .004″ or less. If runout of less than this amount is required, collets should be used to hold the drill rather than a chuck. 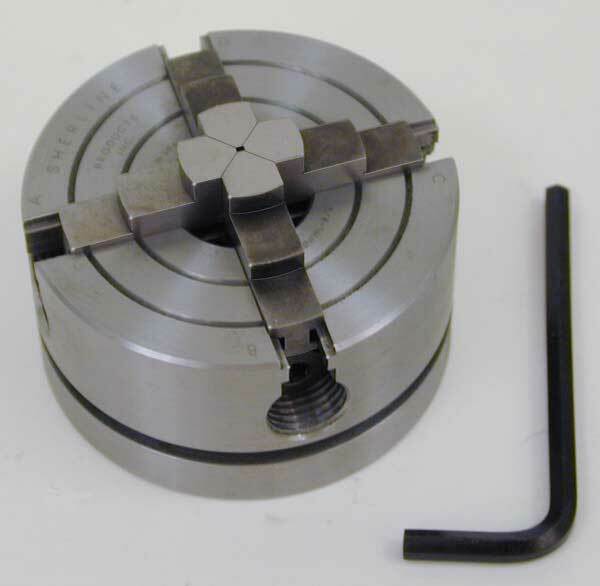 The 2.5″ diameter chuck P/N 1041. The 3-jaw chuck is also available in 3.1″ diameter. Three-jaw chucks are convenient for holding round work quickly. This compact chuck is a good all-around workhorse for most lathe work. It has a clamping range of from 3/32″ (2 mm) up to 1-3/16″ (30 mm) diameter with the jaws in the normal position. With the jaws in the reversed position, work up to 2-1/4″ (56 mm) can be gripped. The hole through the chuck is .687″ (17 mm). Rotating the knurled ring closes all three jaws simultaneously to quickly grip round or hexagonal stock. 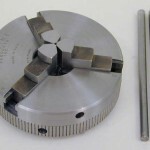 Tommy bars (provided) are used in the holes in the side to tighten and loosen the chuck for more leverage. 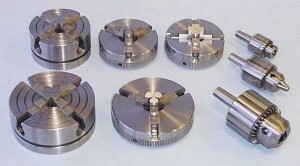 The chuck is available in several spindle threads for use on Sherline and other machines. 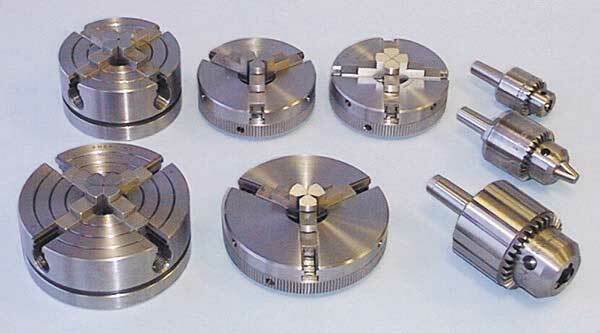 Four-jaw chucks are somewhat less convenient than three-jaws, but they do offer maximum in versatility and centering accuracy. They are available in both 2.5″ and 3.1″ diameters. Four-jaw chucks have four advantages over three-jaw chucks. (1) They can be used to hold irregularly shaped parts. (2) With the use of a dial indicator, they can be used to center parts with a great deal of accuracy. 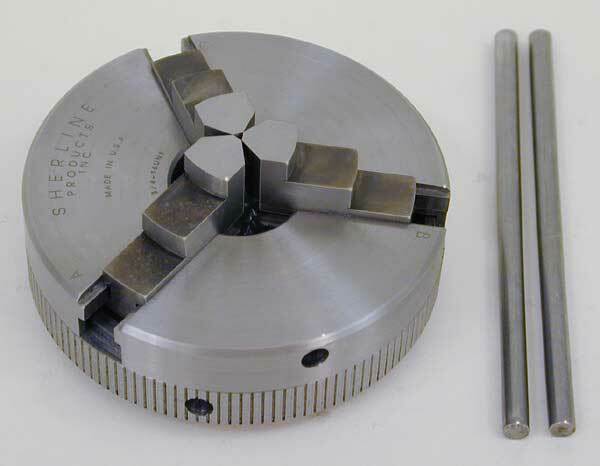 (3) Four-jaw chucks can be used to deliberately hold a part off-center. (4) They can clamp stock tighter. This is a valuable asset when machining cams, crankshafts, and similar parts. The main disadvantage of the 4-jaw independent chuck is that the jaws must be individually set, adding considerable time to setups. A hex key (provided) is used to tighten each jaw individually. 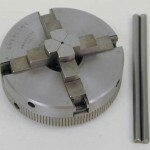 Tommy bars (also provided) are used in the holes in the side to tighten and loosen the chuck for more leverage. A groove is provided around the base of the chuck so that angle clamps can be used to mount it to the table of a mill as a holding fixture. The larger P/N 1030 3.1″ 4-jaw chuck takes maximum advantage of the size available on a standard Sherline lathe. This larger chuck takes up no more center-to-center space than the 2.5″ chuck, but it will hold larger work. It has a clamping range of from 3/32″ (2 mm) up to 1-1/2″ (38 mm) diameter with the jaws in the normal position. With the jaws in the reversed position, work up to 2-3/4″ (70 mm) can be gripped. The hole through the chuck is .687″ (17 mm). A hex key (provided) is used to tighten each jaw individually. A groove is machined around the base of the chuck so that angle clamps can be used to mount it to the table of a mill as a holding fixture. The chuck has a 3/4-16 thread to fit Sherline’s spindle and other machines using that thread. These chucks combine the ease-of-use advantages of the 3-jaw chuck with some of the advantages of a 4-jaw chuck. They will automatically center square or round stock. (The stock must be accurately shaped for all four jaws to grip.) They will also grip thin-wall tubing in four places rather than three, which spreads out the load and allows more grip without crushing the tubing. Turning the knurled portion of the outer diameter of the chuck scrolls all four jaws in unison. 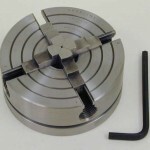 Included with the chuck are two Tommy bars for tightening and loosening the chuck. Sherline 4-Jaw Self-centering 3.1″ diameter chuck P/N 1076. Centering accuracy on self-centering chucks is to within a few thousandths of an inch. If perfect centering accuracy is required, see 4-jaw chucks.